Of course in my "snobby" post on making a "flat-white" I insisted you use whole milk, so if you're good with that, then go for it. But today's post is about using soy milk instead for making lattes and flat-whites. Many people prefer or need to use a non-dairy milk for various reasons, be it lactose intolerance or because they are vegan/vegetarian. I actually adopted a vegan diet nearly 4 years ago and have used soy milk since then, so in that time I have learned something about making soy latte at home. From that experience I have discovered that there is one key difference in using soy milk rather than cow's' milk: the temperature you steam the milk to is critical. 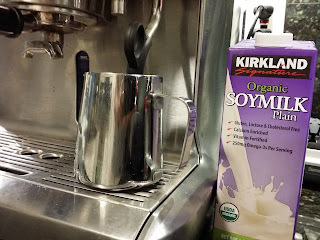 If you heat soy milk to the same temperature as regular milk (up to 140F/60C) then you will find it breaks apart and your lovely cup of soy latte or soy flat-white will become flocculent" (that's the perfect word for what happens - it just so happens that I remember that word from high school chemistry). I have found that up to around 120F/49C is about the right temperature to avoid this happening. 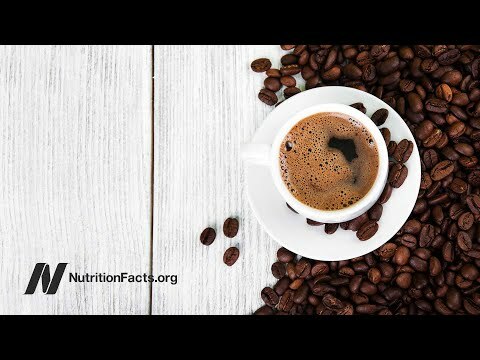 However, that means that the temperature of your cup of soy latte or soy flat-white is not going to be so hot, right? And most of us like our coffee to be hot. So here's a trick I use to get around that problem: I put a small amount of water in my cup first (about 3 tablespoons, I guess) and I put that in the microwave for 30 seconds. This way the cup is very hot to start with and there is the base of hot water makes the entire cup of coffee hotter too. This small amount of water is not so much that there is any noticeable dilution in taste so I just leave it in the cup when I extract the espresso into it. So give that a shot.